Spidey has notable team-ups with Human Torch, Captain America and... Loki!? 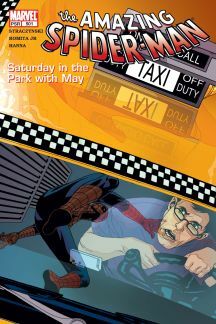 While Spider-Man battled a Shocker-like new bad guy, across town Aunt May chatted with her late husband at his grave in AMAZING SPIDER-MAN #501. Not long after, the webslinger foiled an assassination attempt in AMAZING SPIDER-MAN #502 with help from a tailor who serviced both heroes and villains alike. In SPECTACULAR SPIDER-MAN #6, a more-powerful Dr. Octopus demanded that Spidey unmask, and later returned to his boyhood home in SPECTACULAR SPIDER-MAN #7 to hatch his full scheme. The Super Villain kidnapped the Palestinian ambassador in SPECTACULAR SPIDER-MAN #8 to use as leverage against his webby enemy, and in SPECTACULAR SPIDER-MAN #9, Spidey felt he’d no other option than to publicly unmask. 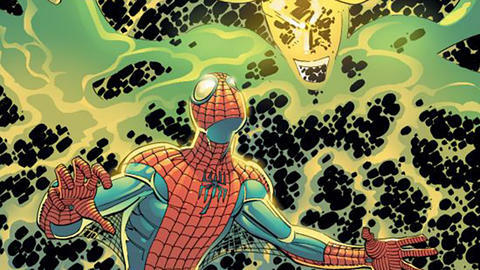 When he did so in SPECTACULAR SPIDER-MAN #10, he revealed only another mask underneath the first one, and proceeded to fight Ock to a standstill. When an other-dimensional woman named Morlen claimed a human host on Earth in AMAZING SPIDER-MAN #503, the Asgardian god of mischief Loki took notice and decided to help Spidey defeat her. After their victory over Morlen in AMAZING SPIDER-MAN #504, Loki gifted the wallcrawler with a favor the hero could call in at any time. 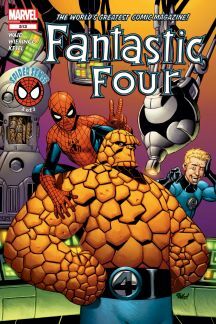 Later, Spidey worked with the Human Torch to fight Hydro-Man in FANTASTIC FOUR #512 and FANTASTIC FOUR #513. Following a tense stand-off with a teen wielding a gun in AMAZING SPIDER-MAN #505, our hero helped his friend Dr. Curt Connors investigate the destruction of the scientist’s lab in SPECTACULAR SPIDER-MAN #11 and SPECTACULAR SPIDER-MAN #12, but when Connors’ alter ego the Lizard hit the scene in SPECTACULAR SPIDER-MAN #13, Spidey knuckled down and fought the scaly specimen back into the swamp. The enigmatic Ezekiel returned in AMAZING SPIDER-MAN #506 to warn Spidey that the Gatekeeper would soon arrive to take back the spider-powers the hero accidentally received as a teenager. When the Gatekeeper revealed himself in AMAZING SPIDER-MAN #507, he informed the webslinger that Ezekiel himself coveted the spider-powers. Waylaid to a temple in South America by Ezekiel soon after, Spidey watched as his own blood transformed into a monster spider and Ezekiel sacrificed himself to save him from it in AMAZING SPIDER-MAN #508. The webslinger joined with his fellow costumed crimebusters to confront Tony Stark over his strange behavior in AVENGERS #501, but when the alien Kree took advantage of the situation to attack New York, Spidey fought as hard as anyone to hold them off in AVENGERS #502. Afterward, he protected a handicapped man from Morbius the Living Vampire in SPECTACULAR SPIDER-MAN #14. Captain America and Spider-Man both confronted a strange woman calling herself the Queen in SPECTACULAR SPIDER-MAN #15, but after she beat the webslinger into submission, she kissed him passionately. Spidey discovered she desired a mate in SPECTACULAR SPIDER-MAN #16, and he and Cap disagreed on the best course of action to squash her scheme. 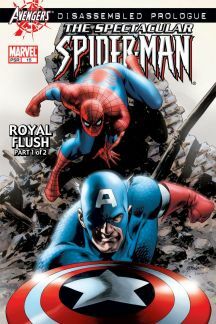 The Queen’s kiss began transforming Spidey into a true insect in SPECTACULAR SPIDER-MAN #17, and Cap revealed the Queen’s origins as another World War II-era Super-Soldier experiment in SPECTACULAR SPIDER-MAN #18. Now a man-spider monstrosity in SPECTACULAR SPIDER-MAN #19, Spidey fought back against the Queen’s desires while the super hero community searched for him. 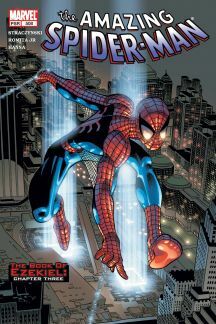 After the Queen’s defeat and the webslinger’s rescue in SPECTACULAR SPIDER-MAN #20, our hero learned he’d been reborn with new spider-like powers. A letter from the late Gwen Stacy arrived at the Parker home in AMAZING SPIDER-MAN #509 with dire news of a secret the girl kept back from Peter while she lived. At Gwen’s gravesite, two shadowy figures attacked Peter and warned him of their wrath. In AMAZING SPIDER-MAN #510, Peter discovered the shocking identities of his attackers: Gabriel and Sarah, twins Gwen delivered while away in Europe, but now inexplicably adults.